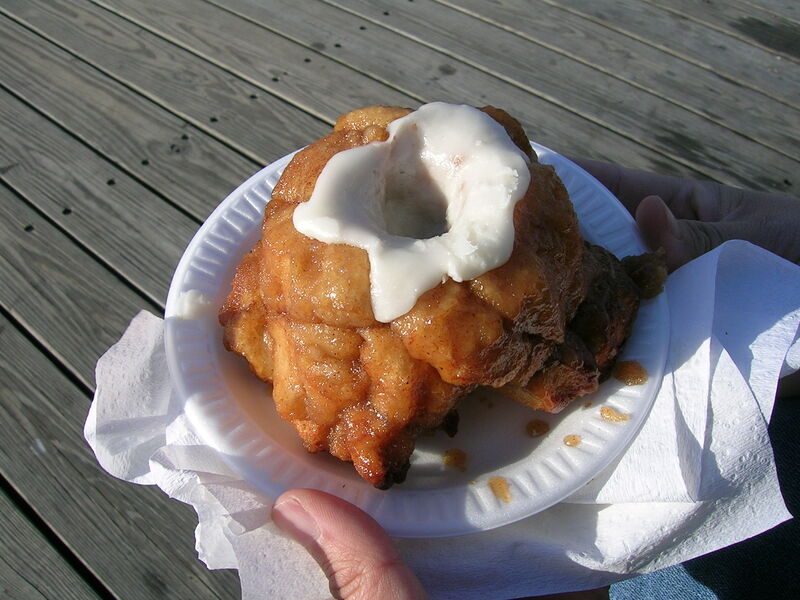 Though I had heard of monkey bread before, I never tasted it until this day. It’s essentially deep-fried balls of dough rolled in cinnamon and sugar. Then, they’re glued together into a cone-like shape with some kind of sugary glue. Since it isn’t unhealthy enough to be considered boardwalk fare at this point, it’s doused with an even more sugary glaze. And how did it taste? It tasted like deep-fried dough balls covered in cinnamon and three layers of sugar. It wasn’t bad, but it wasn’t the best thing I’ve ever put in my mouth. (That’s what she said!) Since I wasn’t blown away by this monkey bread, and considering the health risks associated with eating it, I don’t think I’d get it again. 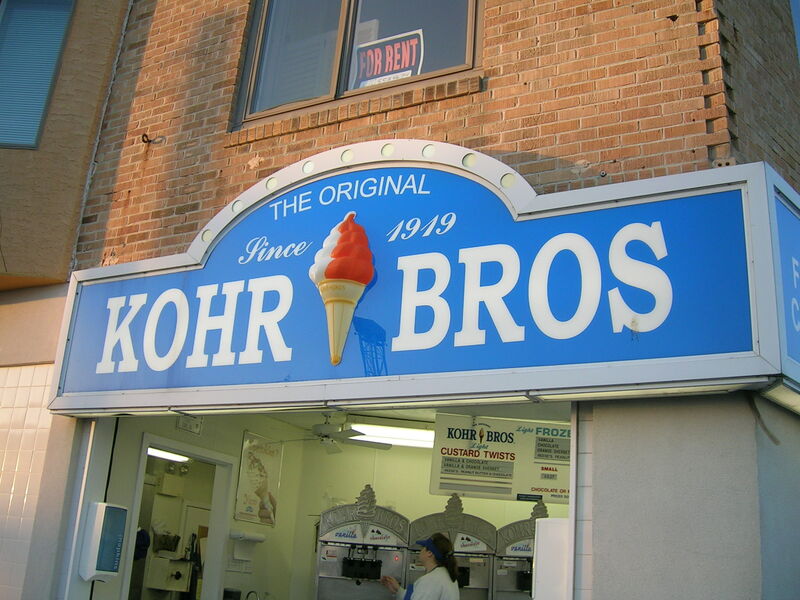 Kohr Bros. is a chain of frozen custard stands, with locations all over the shore. 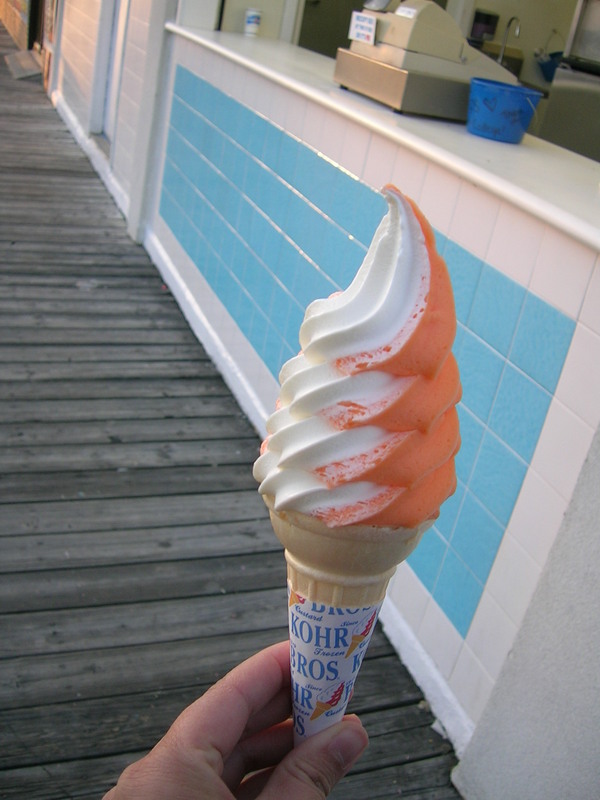 During my youth, no family trip to the Point Pleasant boardwalk was complete without getting an orange and vanilla swirl from them. I still carry on this tradition. Though they offer a few different flavors, which you can get on their own or two mixed together, I always stick with the orange/vanilla combo. How good does that look? It tastes even better. The rich custard offers a nice change from your more typical ice cream. And that streak of orange gives a nice, sharp contrast. I think I could seriously forgo any other frozen dessert and just eat this for the rest of my life. Maybe I’ll try to rent that apartment that’s available in the picture above so I could eat this stuff every day. Now that I got my fill, it was time for the woman to indulge in that most womanly of pastimes: shopping. Usually I hate shopping, but I’m a much better sport at the boardwalk. There are a bunch of little shops selling the most random and interesting stuff. It’s almost impossible to get bored. Actually, there was one other object of interest in the store. They had this metal sculpture thing with all these stars sticking out of it. Perched right on top of the highest star was a big, green dragonfly. I originally thought it was part of the sculpture. It was sitting perfectly on top, hardly moving. I think I would have bought the stupid star sculpture if the dragonfly was included. We then went to the next store, which focused more on practical beach stuff, like sandals, sunglasses, towels…and hermit crabs. 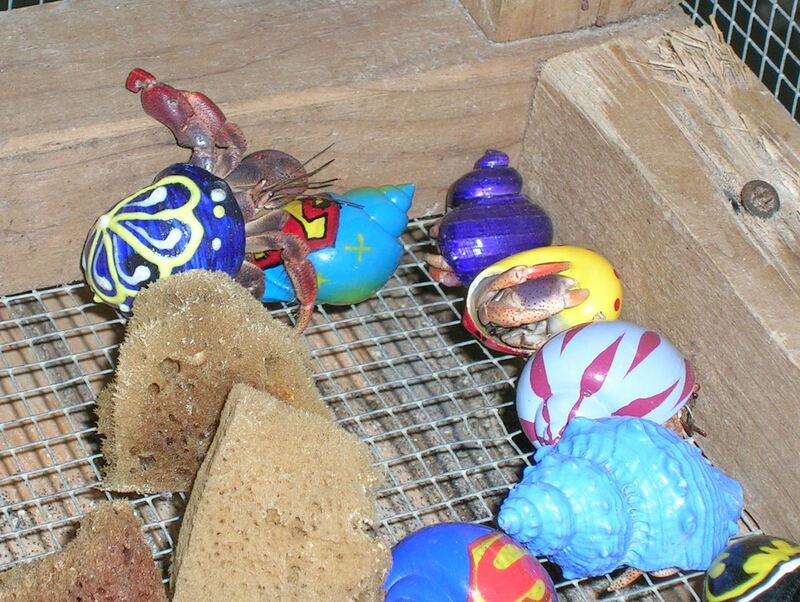 A lot of these little boardwalk shops sell hermit crabs, for some odd reason. But then again, any visitor to the Jersey Shore will end up getting crabs one way or another. The lady running this particular store was pretty damn protective of her crabs. Any time anyone got close, she would make sure no one touched them. She gave me the dirtiest look for taking a picture of her crabs. That lady sure was pretty crabby! 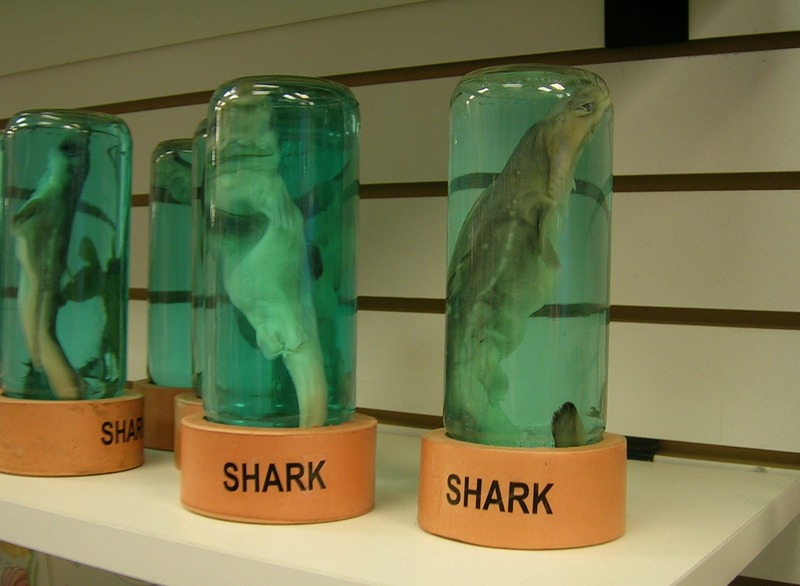 Yes, aborted shark fetuses. Only in the Armpit of America. This entry was posted on May 18, 2010 at 8:36 pm and is filed under Armpit Adventures, Jersey Shore. You can subscribe via RSS 2.0 feed to this post's comments. Great series on the “real” O.C. 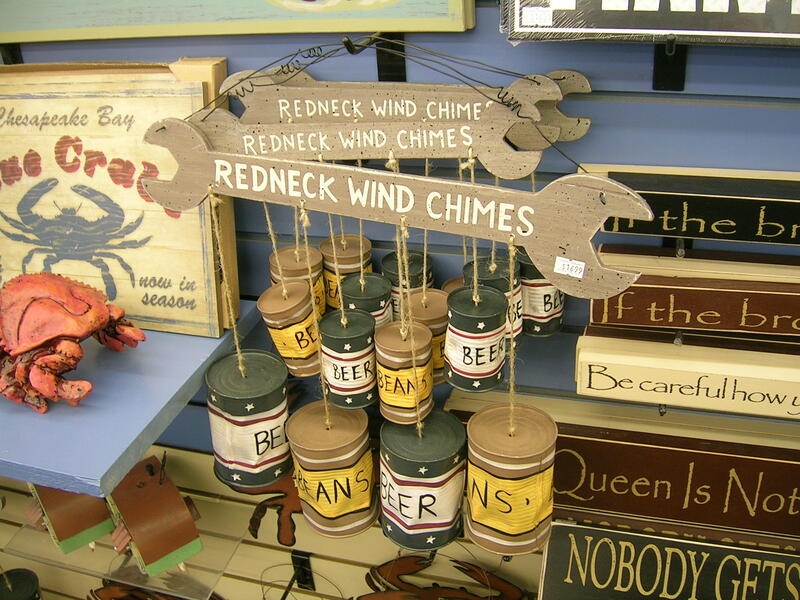 Now I go get me some of that Monkey Bread and redneck chimes for the woman! How about going south a bit and do something about Cape May?